The Levit8 standing desk looks to an origami design to create an affordable, portable device that can transform any desk into a standing desk. As the health dangers of sitting too long continue to surface, many people are looking for alternatives to the typical desk. 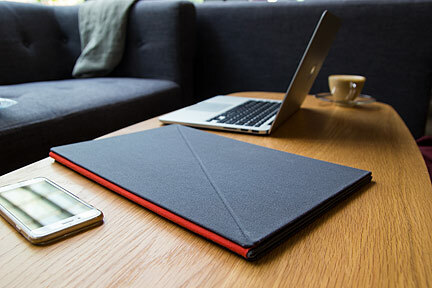 The Levit8 offers a simple yet elegant option, and can transform from a flat form about as big as a laptop sleeve to a desk extension that reaches between 11.8 inches to 17.7 inches high, depending upon the model.